Are you against Santa Clara Measure J? Are you against Santa Clara Measure J (San Francisco 49ers stadium) ? The San Francisco 49ers are spending millions to convince the voters of the City of Santa Clara to agree to subsidize and own a football stadium for their benefit. Among other things, that buys a lot of lawn signs. 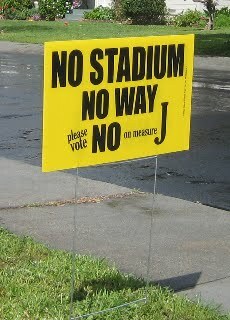 If you want to display your opposition to the stadium, Santa Clara Plays Fair has "No On Measure J" signs for you. But since there is no wealthy corporation paying for the signs it would help if you could make a financial donation, either for the yard signs, for the flyers they distribute, or for a campaign mailer they would like to do to get out the truth about the Santa Clara San Francisco 49ers stadium subsidy . Walking neighborhoods to get the truth out about the stadium subsidy and ownership. Host a house party to provide your neighbors and friends with the facts the San Francisco 49ers and Stadium Five don't want them to know about and to counteract the lies being told. Write a letter to the editor of the Santa Clara Weekly or San Jose Mercury News.